Hello Friends! Today I want to share with you my son's cake and cupcakes I created to help him celebrate his 4th birthday with his preschool class! I cannot believe my child is now 4 years old! I mean geez where does the time fly? People used to stop me all the time to admire Tariq (my son) as a once small baby and I was always told to "enjoy him while he's young and little". I think i'm slowly starting to understand why. With life being so busy sometimes these moments really are just slipping away. I really want to share the joy of celebrating his birthday with you all today so, thank you for stopping by! Tariq is seriously overly obsessed with Monster Trucks. I know, I know, which boy really isn't obsessed with those big wheeled bad boys! Monster trucks really are cool and can crush everything in sight. We honestly have buckets filled with all kind of monster trucks at home. As Tariq's birthday slowly approached I decided that I really wanted to incorporate his favorite monster truck called "Grave Digger" in a fun and simple way. So,cupcake toppers it was ! 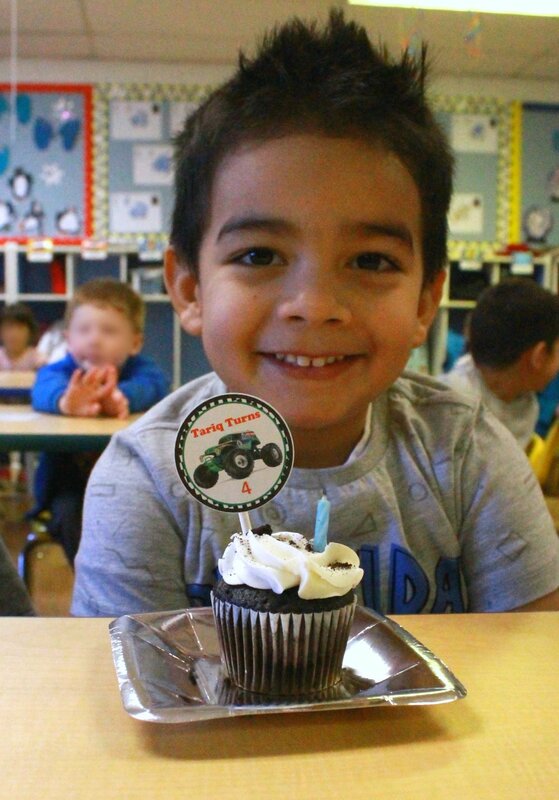 I designed printable Grave Digger cupcake toppers that he just loved ! I can't lie, as much as I love styling, crafting and creating "Pinetrest" style parties sometimes simple is the way a mama has to go! So I did just that! I bought plain cupcakes and decided to crumble oreo cookies all on top! It was the perfect little garnish the cupcakes because it looked like dirt! Monster Trucks + Dirt = YES! Now, if I tell you this cake cost me only $9.99 would you believe me ? I mean seriously, how cute is it ?! I knew by giving it a little love that it needed it would just be the perfect mini cake for my boy. I loved the colors and the way the chocolate dripped around the entire cake. Guess what though... the cake had rainbow colored sprinkles all on the top. Ah! What to do?! The grocery store would not do anything to fix the cake (I asked) and the baker told me all the pre-made cakes are sold as is. I figured I could either pick off some of the sprinkles or I could just cover them up buy adding a topping to it. I decided to just go ahead and add oreo crumbles all over the top and bottom of the cake to resemble dirt as I did to the cupcakes. I designed a cake topper that I added to the top of the cake and that was it ! I mean how inexpensive and simple was that! I hope you enjoyed my simple and inexpensive decorating tips that I shared with you today. 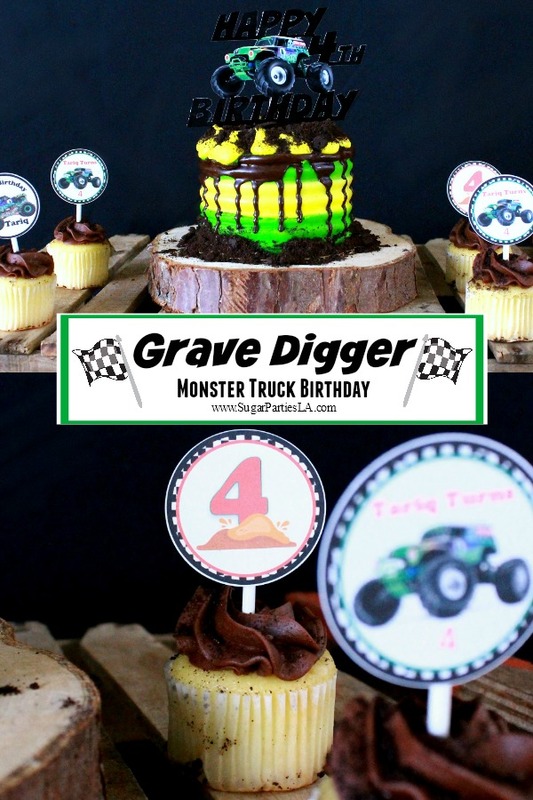 If you love the "Grave Digger" monster truck cupcake toppers I designed I am sharing them for free to all my new and existing subscribers. If you would like to jump on my party wagon over here then please Subscribe below. I would love for you to join in on all the fun and freebies that I create just for you.Thank you so much for stopping by! If you use the cupcake toppers please tag me on Instagram @SugarPartiesLA I would love to see how you used them. Click link to get free "Grave Digger" Monster Truck printable.